If you want to make a page full width, use a Section element and toggle the full width button, or use the landing page style layout. Learn how to make your page full width with our full width layout or the full width feature on the Section Element. Firstly, you will want to drag a Section Element onto your page. From the right-hand menu of the editor, you will notice that there is a 'Full Width' toggle. 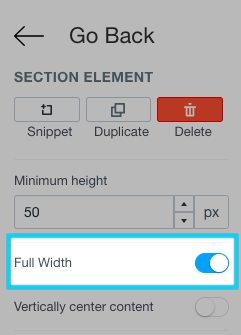 Toggling this will set this Section Element to full width on your page. Note: We have renamed the Box Background element the Section Element.